There are literally wearables for everyone, even people who haven’t technically been born. A startup called Bloomlife is at CES with what it says is the first pregnancy wearable. 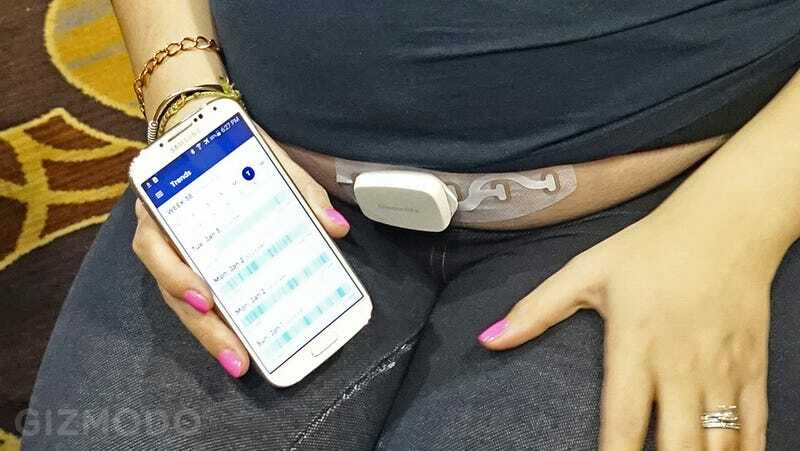 The wearable is intended to be worn by women in the third trimester of their pregnancy and it monitors contractions and then stores the data in an app for iOS or Android that is easy to monitor. The idea is that it can offer the user feedback on how often contractions are happening and how many minutes apart they are, so that expectant mothers and their partners can make better informed decisions about whether labor is starting or if it’s just a false alarm. In an age where we obsessively track everything, this feels utterly inevitable. And for worried parents, it could be a smart idea. Bloomlife seems to understand that this isn’t the sort of thing you buy for longterm use, so it’s leasing the device. A one month lease is $150 and two and three month leases are $250 and $300 respectively. You can pre-order the device now and it’ll be available to ship within the next few months. Right now, the wearable isn’t an official medical device—it’s supposed to be used as a second opinion and for “peace of mind.” Bloomlife hopes to get FDA approval in the future so it can do other types of monitoring and maybe even detect problems in a pregnancy. The battery on the device lasts about a week and the reusable strip can be worn for a week as well.